Stock: Ships same day from USA. 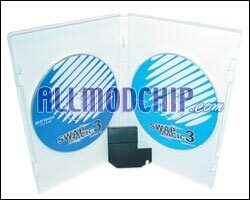 This PS2 mod chip comes with two CDs (Swap DVD and CD 3.6) which allows a wider range of games to be played on the console. Swap Magic 3.3 supports add-ons such as a PS2 slide card for all older versions of PS2 (v1 ? v10). Without complicated installation steps, Swap Magic 3.3 allows the user to play a wide range of backup games for an affordable price. Play backup and import games without ever soldering! The new version of Swap Magic has many features of the older version with added extras. With Swap DVD, there is no need for any extra 3rd party programs, such as DVD loader, to play your favorite DVDs or DVD games. This new version is also very efficient in that it loads all programs on your console much faster than its predecessors (No more waiting!). Along with swap DVD, the buyer also receives Swap CD 3.6. Similar to DVD 3.6, Swap CD requires no 3rd party programs to run backup games. Unlike its older versions, Swap CD 3.6 eliminates the need of refreshing the TOC to make the game readable. Since the CDs are now readable with ease, they do not spin as much, which reduces the damage on your system. Slide Card Tool or Magic Switch Included! Returns & Refunds | Terms and Conditions | Privacy Statement PS2 Mod Chips, Xbox Mod Chips and all modchips are designed for the purpose of using imports and backups of software you legally own. Most mod chips allow you to also install and run unsupported third party applications, such as Linux. We accept no responsibility for the use of these products to run copies of games you do not legally own. Please support software creators. 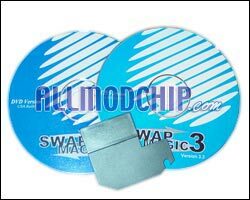 © 2004 - 2007 AllModChip.com, a BestCompWorld LLC Company.